Redwind and your inspiration to write the story. and his new friends before his mom calls him home for hockey practice? 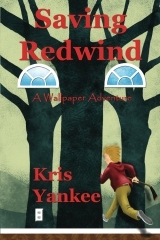 Nick is able to stay in Redwind long enough to help them conquer all the bad guys in Redwind. I love stories that bring home great life lessons for kids! then I needed to spend more time honing my skills and crafting a better story. because I’m an editor at a small press-and then I took it all to Createspace. books? Will we see more in the Wallpaper Adventure series? working on a YA novel with a screenwriter that deals with – of course – hockey! And, I am about to start working on the next book in the Wallpaper series. story and your book with us today! win. Kris says she’ll ship anywhere, so international friends, please feel free to enter! Giveaway ends Thursday 8/11, with winner announced Friday 8/12. Saving Redwind: A Wallpaper Adventure is available in print at Createspace and Amazon.com. You can find Kris Yankee at her website, blog, or on Facebook. This sounds like a book my son would like! Thanks for sharing. Jackie~ That's so wonderful to hear. Thanks for stopping by! Hi Kris! It sounds like a brilliant book and I wish you loads of success! Talli~ Hi, and thanks so much! Sounds like a wonderful book. Great giveaway, thanks!! Territory Mom~Glad you like it. Thanks for stopping by! Great interview! I love hearing other writer's stories. Great interview, thanks for sharing your journey with us! Lisa, It is fun to hear other writer's stories. Thanks for stopping by! Rick, I'm so happy that I was able to share my story. Thanks for stopping by. How fun! I can totally see wallpaper being a great setting for a story, and then the mom calling him back and interrupting stuff. Hilarious! Self publishing is really taking off! I've been so surprised by the number of friends who were going traditional and then switched. It's so fascinating to me. So glad you're making the point about getting input from professionals. LTM~ Thanks so much. I think it's so important that writers who choose to self-publish realize that their manuscript may not be in the best shape. One must be proactive and be sure that the product that's out there is the best it can possibly be. Thanks for stopping by! Well I can win too, right?? I think it's so interesting too that your agent sent you to self-pub. I love that she's thinking outside the box. And you're going about it all the right way, Kris! Pk~ Of course you can win! I was surprised when Christine instructed me to do that. She'd make nothing from all the time and energy she spent before and after she shopped the story around. But she knows the way this industry works and I trust her. Thanks for stopping by! The books sounds so good! I have an, uh, rude question. Did your agent still want 15% from sales of this indie epub? Oh! I just read your last comment. Thanks! Anita~Thanks for stopping by here as well! If my agent helped promote it, we would probably make up some sort of deal if any books sold. But that's not happening, so sadly she'll receive nothing. I'm on submission for two other stories, so hopefully those will sell to a traditional publisher. That's what I really want. I just downloaded your new book. Can't wait to read it! After trying to remember the other time I read a story about someone going into the pictures in their wallpaper, I finally remembered a story I read in school where this guy was going crazy looking at the wallpaper in his room. Obviously it was a completely different kind of story. But it reminded me of the time I read on another blog that there are no new ideas, but maybe there are new combinations of ideas and new ways and styles to present them with. PS: It isn't letting me post a comment using openID. David~ When I was telling a friend about this story idea, she told me about the book you're referring to. I had never heard of that story. To me, this was a completely new concept. Thanks for stopping by! @David Thanks for stopping by – I'll try to figure out what the problem with OpenID is. Thanks for the heads up! Awesome! I too was hooked by the adventures in the wallpaper! Pulled into the wallpaper in his room? Love that concept!!! (I used to see faces in my wallpaper when I was kid). I'd love to win a copy but I promise to buy a copy if I don't win. Alison, Glad you stopped by! Margo, I used to see faces in my grandmothers bathroom tile. Weird. Thanks for stopping by! I HAVE to read this book to my 5th grade class. They'll go bonkers for it. Leslie, That would be awesome! Thanks for stopping by. Hi Kris! It sounds like a brilliant book and I wish you much success!